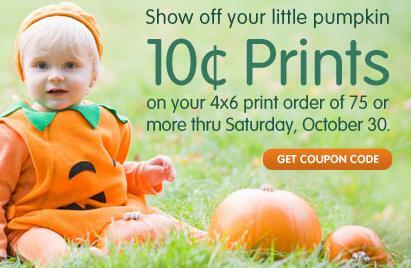 Walgreens is offering $0.10 prints on orders of 75 or more through Saturday, October 30th! Just use coupon code PUMPKIN at checkout. Choose to ship them to a store near you to avoid having to pay shipping! You can also get 25% off all photo gifts through Saturday when you use coupon code OCTOBER at checkout.